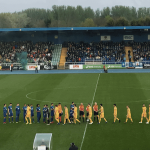 Bastien Héry scored a sensational second goal for Waterford FC as the Blues moved into second spot in the SSE Airtricity Premier Division after a dominant display yielded victory against St Patrick’s Athletic played at a Baltic RSC last night. After Kenny Browne had a headed the home side in front on ten minutes, it was Héry’s wonder strike just after the hour mark that had the majority of the 1859 crowd on their feet as the Blues picked up their second win of the second. It was the ideal start for the hosts as they took the lead with ten minutes on the clock when Izzy Akinade got free down the left before his cross was turned out for a corner kick by defender Kevin Toner. Paul Keegan whipped in the resulting flag kick from the left to the near post where Kenny Browne planted a header past Barry Murphy from six yards. It was Akinade that could have doubled the lead for the Blues just three minutes later when the striker took a pass from Bastien Héry but his left-footed strike flashed over Murphy’s crossbar before Gavan Holohan fired wide from an advanced position soon afterwards. Akinade did have the ball in the back of the saints net on 34 minutes when he took advantage of a miscue from keeper Murphy but assistant referee Brian Fenlon ruled that the ball had crossed the line in the build up. Garry Comerford turned provider for Izzy Akinade six minutes before the half time break but his close range effort was flicked over the bar before the same player had a fine header saved by Barry Murphy on 47 minutes after Gavan Holohan’s cross. 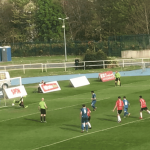 The Blues got their second goal with a quite stunning strike on 61 minutes as Courtney Duffus knocked the ball down for Bastien Héry and his unbelievable 30-yard blockbuster flew past the despairing dive of St Pat’s keeper Barry Murphy. 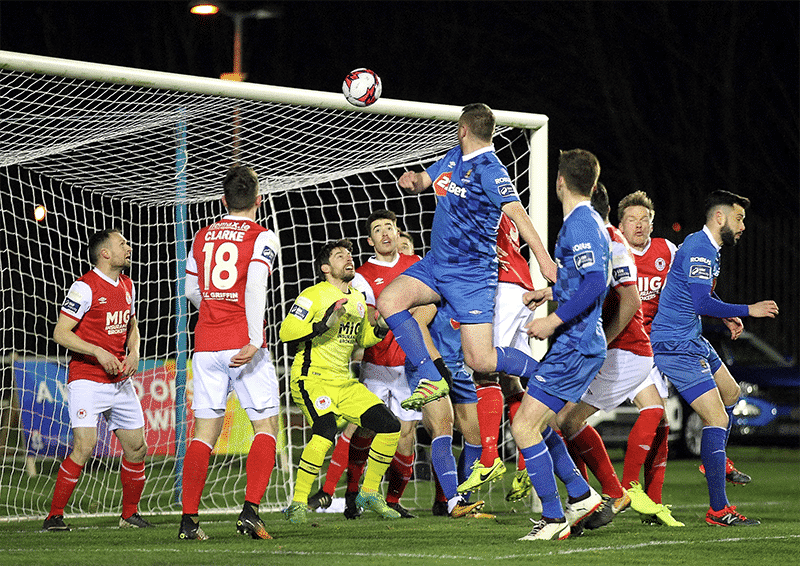 Christy Fagan did have a chance to pull a goal back for the saints nine minutes later when he got free inside the area to meet a right-wing delivery from Simon Madden but his header whistled inches over Lawrence Vigouroux’s crossbar. Rory Feely danced a jig inside the penalty area on 81 minutes when the full back cut in from the right and after skipping past a couple of tackles, his shot whistled just inches wide of the near post as the home side kept their first cleansheet of the season.